They said he was unstable. They said he was dangerous. 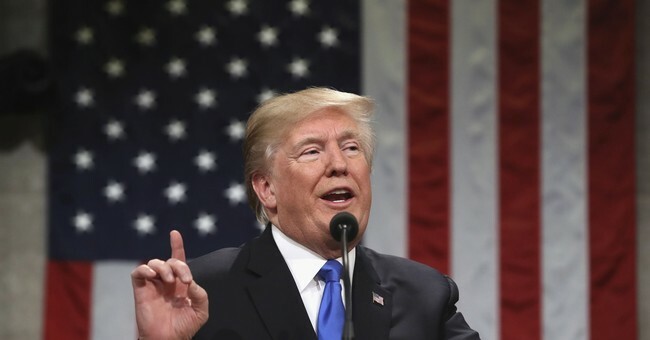 Well, that narrative that the liberal media has been crafting for weeks was torpedoed in about 90 minutes last night when President Donald J. Trump delivered his State of the Union address. Liberals were already going apoplectic over it, with more than a few suggesting that no matter what he says—it’s not presidential. Amid the tantrum came one of the most appalling displays by an opposing party in recent memory. Democrats sat there, silent, fuming, and still sour over the fact that Hillary Rodham Clinton would a) never become president; and b) never deliver the speech Trump delivered last night. They sat on their hands, with Rep. Nancy Pelosi (D-CA) and Sen. Chuck Schumer (D-NY) looking as if they did not have enough fiber in their diet; they were miserable. As were the rest of congressional Democrats, who sat for supporting our flag, our national anthem, economic growth, defeating ISIS, job creation, and tackling the opioid epidemic. They sat on their hands, which pollster Frank Luntz said could have been a monumental blunder. “This speech is going to have a measurable impact on Trump's favorability and popularity. He's saying exactly what people want to hear,” he tweeted during the State of the Union. “Whoever told the Democrats to sit on their hands made a huge mistake,” he added. I have criticized the President's language a lot in recent months. Luntz also noted how Trump was able to push populism, conservatism, and anecdotes to support his agenda. “This speech represents the presidential performance that Trump observers have been waiting for – brilliant mix of numbers and stories, humility and aggressiveness, traditional conservatism and political populism,” he said. Luntz added that while the feeling might dissipate in the coming days, he felt inspired by Trump’s speech. He’s not alone. Trump’s reception of his speech was through the roof, with CBS News reporting that 75 percent approved of it, 54 percent credited Trump for the economy, 54 percent said the polices he outlined would help them, and 65 percent said the speech made them feel proud. If there’s one thing that’s beyond dispute, Trump is a cheerleader for America, which was absent under Obama. Oh, and eight in ten of Americans who watched the address felt that the president was trying to unite the country. This was a "big" SOTU. So many are laundry lists. This was big thoughts on economy (taxes/deregulation/jobs). Big thoughts on foreign policy (bad guys vs American values). A few big bipartisan pitches going forward (infrastructure/immigration). And relentlessly optimistic. Sorry, Democrats—you lose again. He’s truly the Teflon Don—and if he continues to get credit for the economy, specifically the dividends yielded by this tax reform package, and boosts his popularity; the 2018 midterms could become interesting.